The Bangkok Titans have forever been the laughing stock of Southeast Asia. Consistently making the Garena Premier League, but consistently failing to make it out of the group stage. The Bangkok Titans have forever been the laughing stock of Southeast Asia. Consistently making the Garena Premier League, but consistently failing to make it out of the group stage. Since their formation in 2012, the Bangkok Titans have hosted more than 30 players, and are only now just finding a roster that suits them. The first professional event that Bangkok Titans participated in was back in Season 2, July 2012, where they participated in the Thailand qualifier for the Season 2 Southeast Asian regional finals. BKT finished the Thai qualifiers in second place to Blackbean, who went on to the Southeast Asian qualifiers, which was won by Saigon Jokers. Next on the list for the Bangkok Titans, and Blackbean, was the IPL 5 Thal Qualifiers. Again, BKT and Blackbean met in the final, and again Blackbean defeated the Titans, this time 2-1. Again, Blackbean went on to the international event, and again, failing to make an impression for the Thai scene at an international event. In May 2012, Garena officially launched the Garena Premier League, a professional gaming league in South East Asia playing host to eight teams and over 100 games over a six month period. Bangkok Titans featured in the GPL as the sole Thai team, alongside teams such as the Taipei Assassins, Singapore Sentinels and Saigon Jokers. BKT’s first season was a disappointing one, as they slumped to last place with a record of just four wins and 36 losses. 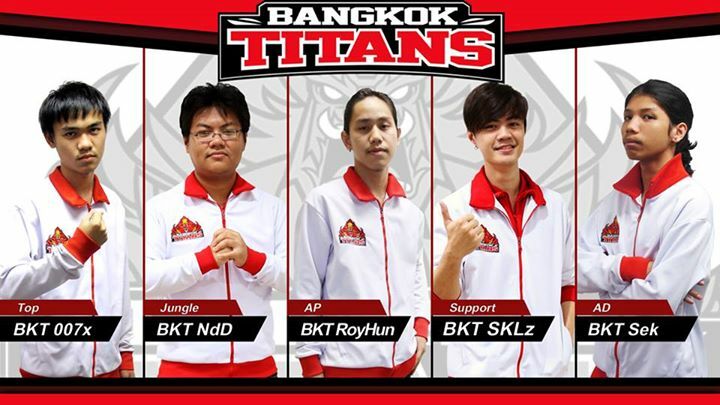 The Bangkok Titans returned in 2013 when Garena announced a second season of the GPL, this time featuring eight teams in the Spring. Again, Bangkok Titans slumped to eighth place. Bangkok Titans struggled with their roster throughout 2013, with 11 different players starting for the Titans over the 14 week league, only jungler NdD was able to hold on to his position. The eight teams returned in Summer, including the Bangkok Titans. BKT rised to 6th in their third GPL season, their first time off the bottom of the standings. Their roster stabilised and positive or even records against the likes of Saigon Fantastic Five, Manila Eagles and the Saigon Jokers showed bright glimpses of hope for the former cellar dwellers. In 2014 Garena announced a revamped GPL format; featuring circuit points, three splits, 12 teams and a clearer qualification scheme. As for the Bangkok Titans, they were joined in the GPL by a second Thai team, Team Infinite. This was the first time BKT had had local rivalry in a premier league. However, both teams were split into different groups, so neither teams had a chance to prove themselves against the other. It didn’t impact the rest of the teams, as Bangkok Titans won the only game between them. Both teams slumped to last place in both their groups, and solidified Thailand at the bottom of the Southeast Asia region. Spring came and the Bangkok Titans improved. Team Infinite had dropped out of the GPL, with the second Thai spot being given to the Philippines. BKT had improved, this time winning two games, both against the new Filipino team, Imperium Pro Team. The Titans’ win rate was equal to Manila Eagles, the other Filipino team, perhaps indicating that Thailand had moved back above the Philippines. In Summer, Bangkok Titans continued their climb, this time getting three wins and qualifying for the group stage. This was a big deal for the Titans. They’d managed to finally find a roster that suited them, and didn’t look like a cellar dweller team in the end rounds of the season. The Titans finished 6th in the Circuit Points, being one of just six teams to have played in all three splits of the GPL. But after six straight GPL campaigns and just a single finals appearance something needed to change. In November, Garena announced that the GPL would no longer feature Taiwanese teams. That meant no more Taipei Assassins, ahq e-Sports Club or any teams from the region. However, the GPL was still expanding to 16 teams. This included six slots to Vietnam, four to the Singapore/Malaysia region, three to the Philippines, two to Thailand and a new slot to Indonesia. 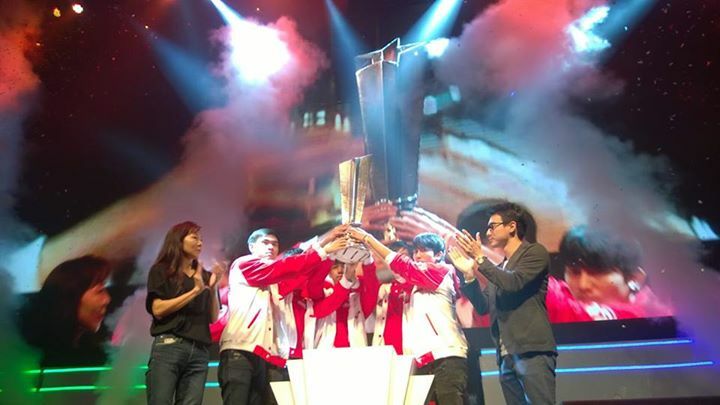 While the loss of Taiwanese teams reduced the competitiveness in the GPL, it increased the growth in the region, and sets the SEA scene up to grow even more. For the first time since their formation, the Titans kept their roster that competed in the previous season, giving the team the whole off season to bond, on top of the 2014 GPL Summer split. Since the start of the GPL 2015, BKT have dominated. After drawing Vietnamese team ASUS Fate and Filipino teams GameX Wargods and Wargods PID Diamond into their group, BKT currently sit atop the group, undefeated and with a guaranteed spot in the second group stage. After finishing first in their 2015 GPL Spring half season, the Bangkok Titans earned the rights to an IEM Taipei Qualifier against the three other group leaders. Four teams entered and two teams left as IEM Taipei participants. The format was a simple four team double elimination bracket, starting with Group A leaders Bangkok Titans versus Group D leaders Insidious Gaming Legends with the second game being between sister teams; Group B leader Saigon Fantastic Five and Group C leader Saigon Jokers. After losing the first game, BKT settled and took down Insidious Gaming Legends 2-1 and moved on to the winners bracket final against Saigon Jokers, who had looked the strongest out all GPL teams. Unfortunately for the Titans, Saigon Jokers were too strong, overpowering the Titans 3-0 to qualify for IEM Taipei. That left Bangkok Titans and Saigon Fantastic Five to play in the final match. Saigon Fantastic Five started strongly, jumping to an early 1-0 lead. But BKT were having none of it and smashed out three wins in a row and finishing with a 3-1 set victory and qualifying for IEM Taipei where they will be joined by the Taipei Assassins, ahq e-Sports Club and Yoe Flash Wolves from Taiwan, Avant Garde from Oceania and Saigon Jokers from Vietnam. It’s been a long time since BKT’s formation, and it’s taken them that entire time to finally come good. Now that they’re holding their own in the GPL, it’s time for them to show it on the world stage. While IEM Taipei isn’t the biggest event, it’s an open doorway to the IEM World Championship with teams such as Cloud 9, Gambit Gaming and World Elite. IEM Taipei starts on the 28th of January with a guaranteed spot at the IEM World Championship for the winner.